TUCSON, Ariz. — Texas Christian is ranked No. 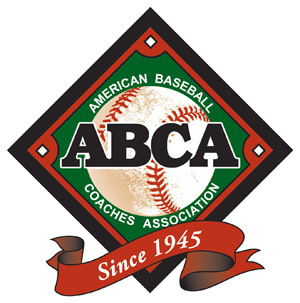 1 in Collegiate Baseball newspaper’s Fabulous 40 NCAA Division I pre-season poll presented by Big League Chew bubble gum. The Horned Frogs feature five Collegiate Baseball pre-season All-Americans as they return eight position player starters and five key pitchers from a ball club that finished third in the nation last season at the College World Series. TCU also landed the No. 8 recruiting class in the nation last fall led by 6-foot-6 LHP Nick Lodolo (Damien H.S., LaVerne, CA), a first round supplemental pick last June in the Free Agent Draft who reportedly turned down a $1.75 million signing bonus by the Pirates to be with the Horned Frogs. TCU has all the ingredients to win the 2017 national championship. The Horned Frogs have a deep and talented pitching staff that tossed nine shutouts last season and sported a 3.18 ERA with 536 strikeouts and only 191 walks over 67 games. It is anchored by Collegiate Baseball pre-season All-American 6-foot-9 RHP Brian Howard (10-2, 3.19 ERA, 93 K, 30 BB) who has a 93 mph down angle fastball, a plus cutter and good feel for his changeup. Also back is RHP Jared Janczak (7-4, 2.61 ERA, 80 K, 26 BB) along with 6-foot-8, 240-pound RHP Mitchell Traver (30 IP, 3.26 ERA, 28 K, 10 BB) who can ramp up his fastball to 96 mph and also has a power slider. TCU returns RHP closer Durbin Feltman (9 SV, 3-0, 1.56 ERA, 27 AP, 49 K), a pre-season All-American, and LHP Ryan Burnett (1 SV, 3-1, 1.97 ERA, 27 AP, 31 K). All of these pitchers will be working with Collegiate Baseball pre-season All-American C Evan Skoug, a veteran lefthanded hitting catcher with power who throws accurately, catches and blocks well. The Horned Frogs may have the best collection of hitters in school history with an intriguing mix of power, line drive hitters and speed throughout the lineup. 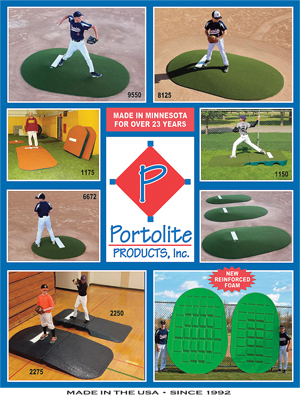 They also have a great blend of righthanded and lefthanded hitters as well as switch hitters. Last season TCU averaged 7 runs per game, hit 139 doubles, 55 homers, 22 triples and stole 97 of 119 bases. The stolen base numbers should rise this season with the return of centerfielder Nolan Brown who was injured last season. He has incredible speed and has the potential to swipe 40-plus bases. Their hitters are extremely disciplined at the plate with 315 walks last season to rank 10th in the nation. Key returning hitters include Collegiate Baseball pre-season All-Americans DH Luken Baker (.379, 11 HR, 16 2B, 62 RBI), C Evan Skoug (.301, 8 HR, 21 2B, 51 RBI, 7 SB) and 3B Elliott Barzilli (.339, 7 HR, 16 2B, 48 RBI, 14 SB). TCU should have a superb defense in 2017. Last season, the Horned Frogs had a fielding percentage of .974. But during their 10-game run in the NCAA playoffs, TCU fielded at a .981 clip. “We have a veteran club with College World Series experience,” said TCU Head Coach Jim Schlossnagle. “We return eight of nine starting position players. We also have our entire weekend pitching staff rotation and closer from last year’s ball club back. To read the in-depth story about why TCU is ranked No. 1, purchase the Jan. 6, 2017 edition or subscribe by CLICKING HERE. 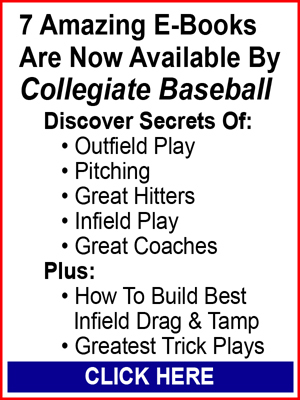 This 2017 College Pre-Season Edition also includes the Collegiate Baseball Pre-Season All-Americans, a list of the top 57 draft eligible college players in the nation who have a chance of being picked in the first two rounds of next June’s MLB Draft. 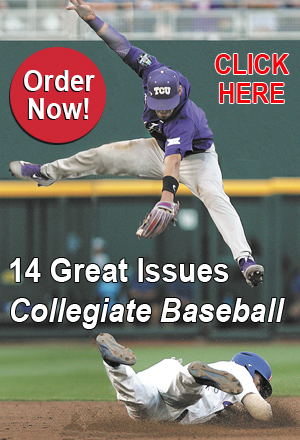 Plus, it has a rundown on the top teams and players in every NCAA Division I conference, including projected Players and Pitchers of The Year. In addition, we delve into every other level of college baseball with in-depth rundowns on the top teams and players in each division. Other Teams Receiving Votes: New Mexico (39-23), West Virginia (36-22), Utah (26-29), Southern Mississippi (41-20), Wake Forest (35-27), Fresno St. (36-22), U.C. Irvine (31-25), Maryland (30-27), Central Florida (26-33), Oklahoma (30-27-1), Cal. Poly (32-25), UCLA (25-31), Nevada (37-24), Nevada-Las Vegas (24-32), San Diego St. (21-38), Oregon (29-25), Southern California (28-28), California (32-21), Washington St. (19-35), Auburn (23-33), Mississippi St. (44-18-1), Kentucky (32-25), Georgia (27-30), Tennessee (29-28), South Alabama (42-22), Alabama (32-26), Arkansas (26-29), Missouri (26-30), Georgia Southern (36-24), Troy (32-26), Arkansas-Little Rock (26-28), Texas St. (31-28), Brigham Young (37-17), San Diego (27-29), Pepperdine (29-24), St. Mary’s (33-25), San Francisco (22-34), New Mexico St. (34-23), Oral Roberts (38-21), Seattle (37-21), Grand Canyon (25-28-1), Michigan St. (36-20), Indiana (32-24), Minnesota (36-22), Ohio St. (44-20-1), Illinois (28-23), Iowa (30-26), Western Michigan (22-34), Central Michigan (24-37), Missouri St. (38-21), Southern Illinois (31-25-1), Ball St. (32-26), Louisiana Tech. (42-20), N.C. Wilmington (41-19), Morehead St. (32-27), Kennesaw St. (28-27), Florida Gulf Coast (27-32), North Florida (39-19), Lipscomb (31-27), Rhode Island (31-27), St. Joseph’s (31-23), Virginia Commonwealth (38-19), Xavier (32-30), Creighton (38-17), Seton Hall (38-20), St. John’s (28-26-1), Gardner-Webb (37-21), High Point (32-24), College of Charleston (31-26-1), William & Mary (31-31), Wright St. (46-17), Princeton (24-21), Dartmouth (18-25), Fairfield (32-27), Miami, Ohio (27-29), Florida A&M (31-21), Alabama St. (38-17), Indiana St. (35-21), Wichita St. (21-37), Bryant (47-12), Southeast Missouri St. (39-21), Austin Peay St. (30-23), Jacksonville St. (34-24), Tennessee Tech. (31-24), Navy (43-16-1), Lehigh (25-29), Mercer (38-23), N.C. Greensboro (38-21), Western Carolina (31-31), Lamar (35-19), McNeese St. (31-25).